Bunker M RGB fulfills the requirements of the Qi standard and delivers fast wireless charging for your mobile phone. 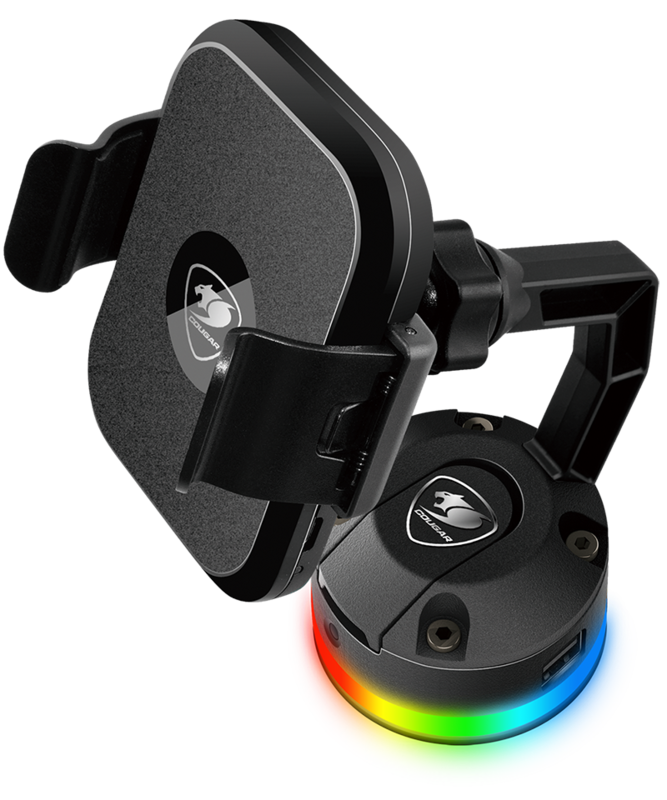 Bunker M RGB does much more than charging: thanks to its adjustable stand and its suction pad, it works as a convenient tool to hold your phone in any position you want. Two convenient USB ports for charging, synchronizing or quickly copying data. Remove the protective membrane and clean the surface on which you plan to use COUGAR Bunker M RGB. Place COUGAR Bunker M RGB on the desired surface, with the suction pad facing downwards, and press the mouse bungee’s base gently against it, then push the lever downwards. The suction pad has a degree of stickiness. If, after prolonged use you notice a decrease in the steadiness of the device and a weakening of its suction, Please wipe the surface with a damp cloth. When it dries, its original properties will be restored. In order to enjoy 10W fast charging, please use a QC 2.0 or QC 3.0 adapter (sold separately). It is also possible to use the wireless charging function (with a slower charging speed) by connecting the charger to a computer's USB port.